On March 14, Yuan Shan Shan, Chen Xiao (Nothing Gold Can Stay), Zhang Zhe Han (Zhao Ge) and Mi Re (Demon Girl) attended the fan meeting for Above the Clouds 云巅之上. All of them belong under Yu Zheng Studio and practically take turns appearing in various Yu Zheng dramas. When asked about her soon-to-expire contract, Yuan Shan Shan expressed that she will not be renewing but that she would come to help whenever she is needed. On the same day, Yu Zheng weibo'd, "#Above the Clouds shines once again! Life, a few years bad, then a few years good, most people are short-sighted, only seeing the interest in front of their eyes...... rising through tens of thousands of people, falling no better than a dog...... this is the entertainment industry.... so, watch dramas, dramas are life"
Many assumed he was throwing shade at the actress, which is why he quickly followed it up with another post saying that it's funny that he's become news when he was merely sharing his thoughts on the drama. He ended the post with, "@Yuan Shan Shan Add oil! Whenever wherever, always support you!" 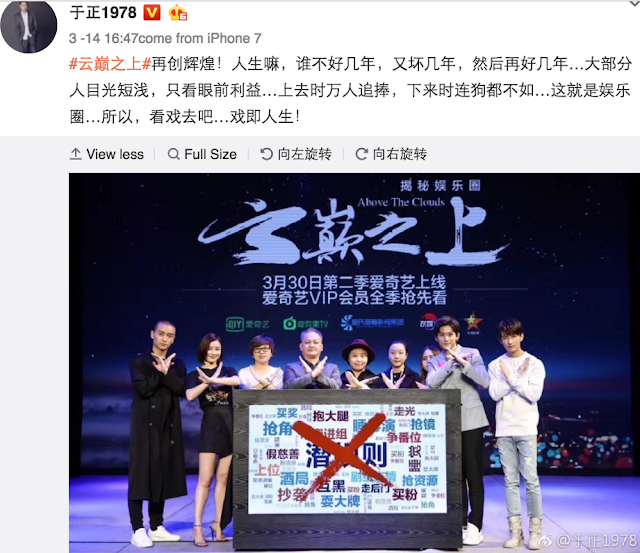 In his defense, I've been noticing the Producer Director actively promoting the show for some time now, analyzing every nitty gritty detail about it and it is literally a tell all of the Chinese entertainment industry - the good and in the case, the bad that comes along with it. I mean he did put hashtag AbovetheClouds.